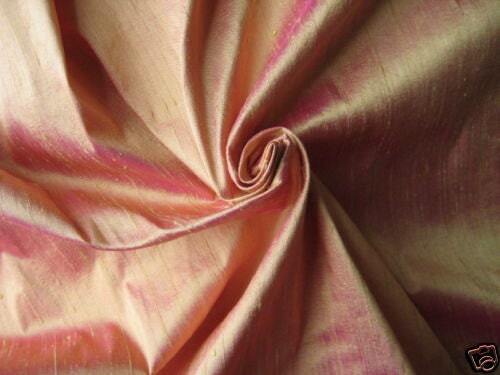 Light Orange Magenta iridescent dupioni silk fabric. Brand New High-End Dupioni Silk Fabric Yardage. 45 inches wide. It is beautiful! Introducing our latest 2014 color! The color and silk fabric are perfect!! It exceeded my expectation. The service provided was prompt, efficient, and professional. I plan to order again soon!! Great quality, received in good time. This fabric is exactly as shown in the image. It's truly stunning. I was amazed at how quickly the item shipped and was received within a couple days. I am so impressed and thrilled I found DesignersNeeds!!! I will come back again and again! Absolutely beautiful fabric, and shipped incredibly fast! Thank-you so super much! Possibly the most beautiful silk I've ever seen. High-quality and substantial. Thank you!